The Nunature Rose Geranium Bath & Shower Cream is rich with antioxidants to protect your skin cells against free radical damage. Infused with fine rose water, this pampering shower cream gently cleanses impurities without drying your skin. It particularly helps to plump, smoothen and moisturise dry or mature skin while providing immediate comfort to all skin types. Rose water is remarkably versatile with its excellent high level of antioxidant and anti-ageing compounds. Enjoy the rose floral scent for a harmoniously refreshing bath that soothes your mind and senses. The shower cream contains Indian Kino Tree Extract, a powerful anti-ageing ingredient that shields your skin's protective barrier and increases skin’s metabolism for brighter, youthful complexion. Kickstart your natural anti-ageing body care regimen to achieve healthy, radiant skin with Nunature's range of bath and shower creams. Pour desired amount into hand or body polisher and lather over wet skin. Rinse well after use. Avoid contact with eyes. Should this occur, rinse immediately with clean warm water. A natural protective barrier for your skin. Don’t let pollution get under your skin. The Nunature Anti-Pollution Bath & Shower Cream prevents the harmful effects of pollution which weaken your skin’s protective barrier and its restorative ability – leading to ageing, dull skin prone to dryness and other skin problems. Composed primarily of plant-based active ingredients, the bath cream continuously improves your skin to regain its radiance while coping with the changes in our environment. The micro protein from Moringa seeds protects your skin against environmental stress and pollution such as dust and harmful UV rays by improving skin’s sensorial and mechanical properties. Suitable for daily use, the bath cream is particularly suited to fight pollution and strengthens your skin’s anti-ageing defense. The shower cream contains Indian Kino Tree Extract, a powerful anti-ageing ingredient that shields your skin’s protective barrier and increases skin’s metabolism for brighter, youthful complexion. 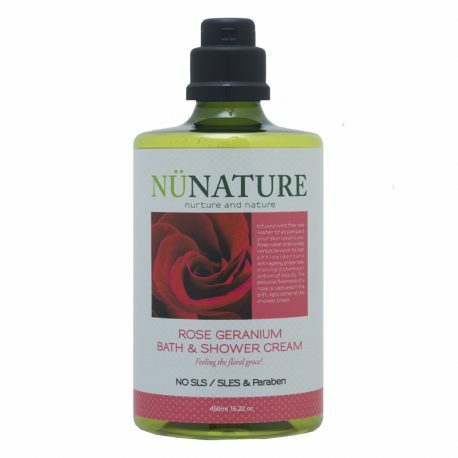 Kickstart your natural anti-ageing body care regimen to achieve healthy, radiant skin with Nunature’s range of bath and shower creams. Recuperate, revive, relax and rejuvenate your body and mind. 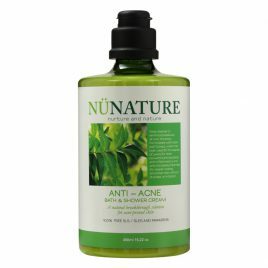 The Nunature Anti-Acne Bath & Shower Cream thoroughly clears sebum and dirt lodged deep in pores without drying your skin. Suitable for daily use, skin is deeply cleansed by limiting excessive sebum production on your back, nest and chest to combat acne breakouts and blackheads caused by grimy blocked pores. Formulated with Neem Leaf Extract, a beneficial plant used for thousands of years for its strong anti-bacterial, anti-inflammatory and anti-microbial properties, this shower cream reveals a clearer and smoother skin without any irritation or dryness. 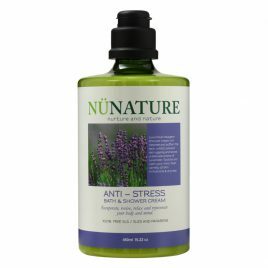 The Nunature Anti-Stress Bath & Shower Cream nourishes your skin with its moisturising ingredients designed to gently cleanse the most sensitive of skin types. The tender whiff of lavender helps you to unwind from daily stress, making bath time a truly relaxing experience. Suitable for daily use, the bath cream soothes delicate skin without stripping it off of moisture. Perfect rejuvenating treat for body and mind. The shower cream contains Indian Kino Tree Extract, a powerful anti-ageing ingredient that shields your skin's protective barrier and increases skin's metabolism for brighter, youthful complexion.